With support from DOE’s Office of Electricity, PNNL engineers modeled energy storage operations to determine the long-term financial benefits or value to Portland General Electric. 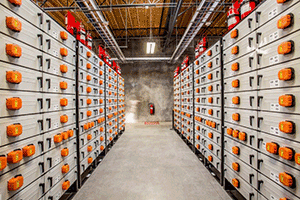 Shown here are rows of battery racks at PGE’s 5-megawatt Salem Smart Power Center in Salem, Oregon. Photo courtesy of PGE. Flip a switch and light cuts the dark, but few of us stop to think about how those electrons made it to our living rooms—or how that energy, as a service, is valued. The United States has traditionally relied upon large, centralized power generation sources with energy flowing in one direction—from the source to the consumer. However, beyond our living room light switch and up the wire from our homes, change is happening across America’s energy infrastructure. Today’s power grid is decentralizing with renewable sources, such as wind and solar generation, and with energy flowing to and from grid-scale energy storage systems. Distributed energy resources like these are not only making the nation’s power grid far more resilient, but also far more complex. As a result, traditional economic and infrastructure models, public investment, procedures, and regulatory processes are becoming obsolete. Evaluates the capabilities of available tools, such as PNNL’s Battery Storage Evaluation Tool, to estimate value for specific energy storage system deployments. “As our society moves from centralized power generation-based systems to more dynamic, distributed energy systems, the work we are doing here at PNNL can provide a means to better understand the value of energy services—and provide utilities and policymakers a tool to inform their planning and decision making,” said Patrick Balducci, PNNL chief economist and lead author of the paper. PNNL Research Team: Patrick J. Balducci, Jan Alam, Trevor Hardy, and Di Wu.